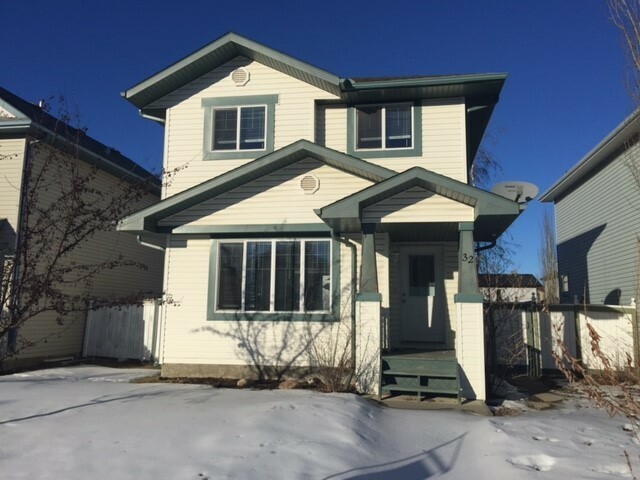 Located in the Heatherglen Community this house is just blocks from the Trans Alta Tri Leisure Center and major shopping amenities on the corner of Jennifer Heil Way and Highway 16A. If your commuting into the city, or surrounding areas, you can be in Highway 16 within seconds!! This homes location in Spruce Grove is hard to beat! Enter the front door and be greeted by a spacious living room fill with natural light from the 4 panel front window. You will notice the gorgeous laminate flooring and enjoy the spacious from hall closet. Head into the kitchen a be greeted with clean lino flooring and a massive kitchen complete with fridge, stove, microwave and even a dishwasher!!! Not to mention a large pantry and tons of both counter and cupboard space. You will love this kitchen!! Another large closet off the back door and a half bath complete the main floor. Head upstairs and find a large master bedroom featuring both a view of the backyard and a walk in closet! A full bath with tub shower and two more bedrooms finish the top floor of this home. As you head to the finished basement you will find a second entrance to the backyard as well as another full bath with tub shower. A large living room in the basement is adjacent to a second mini kitchen, complete with mini fridge, hot plate and microwave. Two large storage closets and a medium sized laundry room are just down the hallway. Other features of the home include a double detached garage!